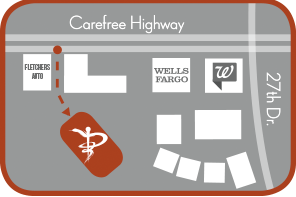 Pure Health & Wellness is conveniently located off of the I-17 and Carefree Highway in north Phoenix. 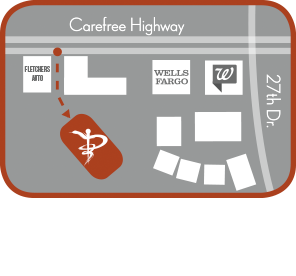 Our office is right behind the Fletcher’s tire centerin the Sonoran Desert Village Plaza, directly off of Carefree Highway in a large office complex. Please enter building 6 through the main entrance at suite 140, once in the main lobby, go down the hallway to the right and you will see our office on the left. We have our door open during business hours and occupy two suites in the building – you can’t miss us!